90 lenses per box @ $71.26 per box. Minimum order 2 boxes (three months' supply). 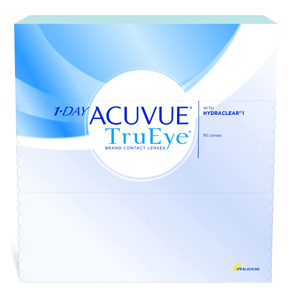 The ultimate evolution of the original Acuvue 1 Day lens, the 1 Day Acuvue TruEye is the first daily lens to be made from a new, highly breathable silicone hydrogel material called Narafilcon A which enables it to deliver a higher amount of oxygen to the eye than a standard lens, while at the same time locking-in moisture. End result: the most comfortable daily contact lens.